Alcohol dependence is a major risk factor for suicide. It can also be used as a means of coping for other risk factors such as the loss of a loved one or failing health. Like depression, alcoholism is a distinct illness in its own right, but it can also be a reaction to other problems. Some studies suggest that it is second only to depression as a precipitating factor of suicide. Alcohol dependence can be a root cause of depression (addiction causing depressive symptoms) or a consequence of depression (turning to alcohol for relief from depression) where a person develops dependence over time. The overlapping symptoms of these two illnesses can make their distinction less than clear-cut; the person suffering from depression may not even realize that their alcohol consumption is contributing to their circumstances. All of these factors make an assessment of someone who might be suicidal a very difficult operation. The greater the need, then, to discuss the complex role that alcohol dependence plays in suicide. Alcohol dependence is a major risk factor for suicide. Drinking alcohol does not in itself cause someone to become depressed and suicidal. 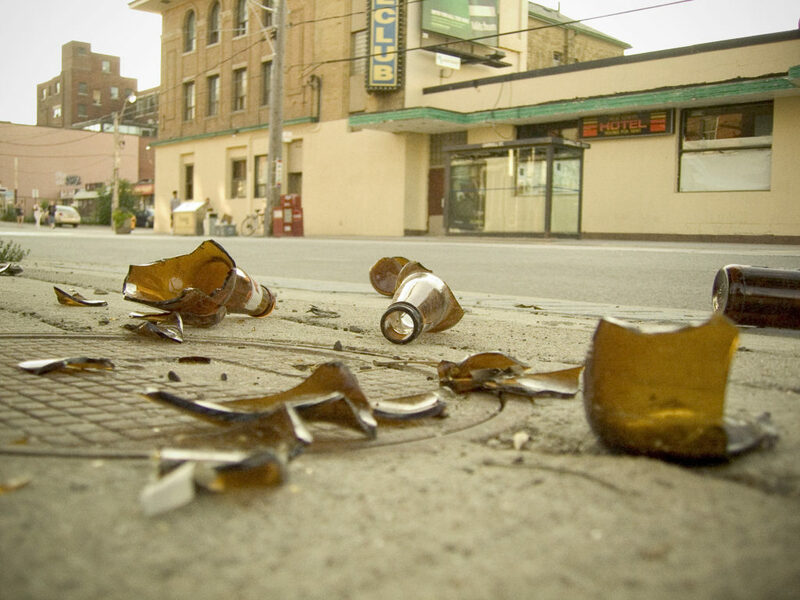 But for an estimated 4-12% of the population in Canada and the United States, alcohol dependence can become a serious and life-threatening issue (Hasin, 830). Initially, alcohol may offer temporary comfort to these people, but all-too-often it can become destructively addictive. Consequences of addiction can include job loss, domestic troubles, and violent and/or criminal behaviors. Additionally, one might suffer from increasing social withdrawal, a breakdown of social bonds, and societal marginalization. This may lead to a dramatic decrease in self-esteem and increasing reliance on acquaintances who are practicing alcoholics. If left unchecked alcohol abuse can lead to depression and, ultimately, suicidal thoughts and actions. The identifiable signs of alcohol dependence include an increasing tolerance to alcohol, experience of withdrawal symptoms, blackouts, failure to control the amount consumed, alcohol becoming a focal point in one’s life, and continued use despite knowledge of its harmfulness. Alcohol is not the only substance that, when abused, increases the risk of suicide. Both illicit and legal (particularly prescription) drugs can play a part in increasing the chances of a suicidal death. Some statistics show that more than half of all people who die by suicide were intoxicated at the time of death (alcohol or other drugs) (NSSP). And a person with alcohol dependence is up to ninety times more likely to be at risk for suicide than the norm (Sher, 59). Unlike other drugs, however, alcohol holds a unique and privileged status in our society. It is very accessible, socially acceptable, and its use transcends all borders of age, gender or background. The general public chooses to think of alcoholics and alcoholism as the province of the homeless and the disadvantaged—the stereotypical dishevelled man drinking under a bridge, paper bag in hand. It is not generally recognized as an illness which affects all levels of society and it is even less acknowledged as a factor in suicide. Why do so many people turn to alcohol? Alcohol is relatively inexpensive, easy to obtain and, perhaps most notably, is legal. It does not hold the notoriety of street drugs, and does not require a physician’s prescription. Canny, ubiquitous, and increasingly invasive advertising promises us the world if we purchase the right label and, ironically, alcohol does just that for many. For a brief interlude, it provides a better world than the one in which they are living…or so it seems. Unfortunately, for the portion of the population that is susceptible to alcohol dependency, turning to booze can be a dire choice when it transforms from a liberating elixir to an enslaving poison. To the alcoholic, alcohol itself becomes the most important thing in the world, often to the detriment of all other areas of his or her life. The identifiable signs of alcohol dependence include an increasing tolerance to alcohol, experience of withdrawal symptoms, blackouts, failure to control the amount consumed, alcohol becoming a focal point in one’s life, and continued use despite knowledge of its harmfulness. Any one of these traits in isolation, or a few of them in combination, can signal dependence. How does alcohol dependence contribute to suicide risk? Alcohol can offer the boost of “liquid courage” that an individual needs to put a suicide plan into action; in this case, the distress that a decision to end one’s life can cause is eased by the booze. In other cases one’s sound judgment can become impaired causing normal, sober inhibitions to disappear and make suicide seem like a reasonable option. Alcohol can also ignite the impulsivity to carry through with an attempt that might not have occurred otherwise (Pompili, 1392). It is also worth noting that those who have used alcohol at the time of death often choose a more lethal means of suicide such as firearms. (Sher, 59). Alcohol dependence affects all demographics and cultures. Young, old, black, white, male, female—no one is immune. For example, those over 65 years of age abuse alcohol more than any other drug. They also have the highest suicide rate of any population cohort. The numbers of actual deaths are undoubtedly higher, as some symptoms of chemical dependency are often attributed to “aging, illness or major life transitions,” and not necessarily alcohol abuse or alcoholism. These symptoms – which could be treated with proper diagnosis – are accepted as “natural” signs of getting old (Osgood, 81-82). If this current trend persists, seniors dying by suicide could reach alarming levels as the large baby boomer generation moves into their seventies and eighties. Looking at the trends in the senior demographic also shows us how alcohol dependence can manifest itself in more than one way. Osgood (82) suggests that there are those who are “early onset drinkers” – those who have always had a dependence on alcohol but have “survived” into older age only to have their problems compounded. Those drinkers labeled “reactive problem drinkers” become dependent on alcohol in later life as an attempt to “self-medicate.” This self-induced sedation is meant to reduce or numb stresses in their lives such as the loss of spouse, failing health, or loss of independence. Ultimately, members of both of these groups have a greater risk for suicide because of their relationship with alcohol. Similar complex relationships between alcohol dependence and suicide exist in many other populations, including youth, middle-aged men, and select ethnic groups. What can be done about alcohol dependency and suicide? Education and awareness of the link between alcohol dependency and suicide must be increased exponentially to help prevent future suicides, and better detection and more accurate assessments must be achieved. Many who suffer from alcoholism or depression may not fully or accurately be informed about the toxic and addictive nature of alcohol. Also, they may not be aware of the myriad supports available to them. We must better disseminate information to clinicians, social workers, counselors and other professionals. They, in turn, can inform the persons-at-risk that they treat. Education and awareness of the link between alcohol dependency and suicide must be increased. As with so many other areas of suicide prevention, a large part of early detection falls on the shoulders of front-line health care clinicians and physicians. Because they will more often encounter people seeking help for depression than for alcohol abuse, people displaying depressive symptoms should be screened for suicide risk and asked specifically about any possible alcohol use. Often a patient will be prescribed anti-depressants for their condition, which can be beneficial. However, if anti-depressants are unwittingly prescribed to an alcoholic and the “patient continues to drink,” this use of prescription drugs “can actually increase suicidality” (Pompili,1409- 1410). A referral for psychological assessment and possible counselling is also a recommended, viable option for those suffering with depressive symptoms. When clinicians screen for suicidality, they should try to gauge whether or not someone is alcohol dependent as well. Depending on the individual, they may be reluctant to disclose their actual consumption because of the stigma and shame that so often accompanies alcoholism. If there is any suspicion that alcohol might be a factor in the patient’s depressive condition, it is crucial that the patient is questioned and encouraged to be very honest about their use. A potentially dangerous situation is created when a long-term alcoholic decides to quit drinking without first seeking and adopting proper systems of support. Aside from the serious physical dangers that could develop when one decides to quit “cold turkey,” there is a great risk that he or she may develop suicidal thoughts when this former coping mechanism— alcohol—is removed. In this case, they should be sent to a detoxification centre – for a minimum of five days – to ease and properly treat the unpleasant physical and psychological alcohol withdrawal symptoms. This initial step should be followed by a (minimum) two week session at an alcohol recovery center, where the newly recovering alcoholic has access to create a strong support network with counselors, fellow alcoholics, and medical professionals. After leaving the recovery center, the individual can depend on the strong system of support they have built to guide them through the next stages of their transition to a sober life. Within this system, support groups are an invaluable resource for the recovering alcoholic. These groups provide the opportunity to socialize with members in similar situations, which helps to alleviate the isolationist tendencies experienced by many alcoholics and depressives. Twelve-step programs, such as Alcoholics Anonymous, have proved remarkably successful in helping alcoholics bond with one another in light of their shared illness. An integral part of the program is helping alcoholics address underlying issues which may be causing their drinking (and often accompanying depression), by working what they call the “12 Steps”. While common sense dictates that there is no such thing as a “onesize-fits-all” program, two alternative options for recovery support group involvement include Smart Recovery and the self-help-emphasizing group Rational Recovery. This is by no means an exhaustive list of programs. Support groups are an invaluable resource for the recovering alcoholic. While this discussion is intended to create a better awareness of the connection between alcohol dependence and suicide, it is important to recognize the issue as another important piece in the larger struggle of suicide prevention as a whole. What we are not advocating is yet another impotent restriction or prohibition on alcohol, nor are we heading up a new witch hunt against it. If one thing has become obvious since the days of prohibition, it is that alcohol is here to stay. Our intent is to expose the very real dangers that exist for certain segments of the population when alcohol is sadly misused and abused. Do you think that the singling out of alcohol in relation to suicide may be overstated? Hasin, Deborah S., et al. (2007). Prevalence, Correlates, Disability, and Comorbidity of DSM-IV Alcohol Abuse and Dependence in the United States. Archives of General Psychiatry, 64(7), 830-842. National Strategy for Suicide Prevention. (2001). Substance use disorders and suicide. Rockville, MD. : U.S. Department of Health and Human Services. Osgood, Nancy. (1992). Suicide in later life: Recognizing the warning signs. New York: Lexington Books. Pompili, M. et al. (2010). Suicidal behavior and alcohol abuse. International Journal of Environmental Research and Public Health, 7, 1392-1431.